About 12 hours into Borderlands 2, in a pile of skag feces that was no different from any of the other hundred piles of skag feces I’ve rummaged through, I found it: my perfect assault rifle. Looking at it on the ground, reading the stats popping up on my screen, I didn’t yet know it was exactly the rifle I’d been looking for. Really, I didn’t know there was a single type of machine gun I wanted. It was only a green piece of loot – special, but not that special – and while all the stats (damage, reload speed, accuracy, fire rate, etc.) were marginally better than my previous machine gun, that still didn’t mean it would be better. But when I picked it up and fired a few potshots at a nearby wall, I knew I had found exactly the gun I had been after all this time. This was the gun that would make my character. 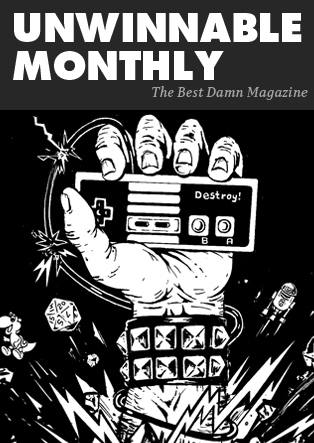 In first-person shooters, all we really know about our character is the gun he is holding. Sometimes, we might see him in cutscenes or special, third-person sequences (like in Halo); sometimes we might hear his voice (like in Far Cry 3). But often we know nothing of the character beyond a name and what he’s holding in his hands. As such, the gun we find ourselves holding in a first-person shooter is a unique chance for the game to tell us something about that character. The gun is the character, and the player is the gun. The Modern Warfare games use this to great effect throughout their single-player campaigns. As each game throws the player’s perspective to a different character on a different continent almost every other mission, it’s important that the player knows who he is. Or, at the very least, what broad archetype of a character he fits into. Sure, every mission has the player doing the exact same thing mechanically, but the context of who the player is enacting can greatly shift the tonal nuances of each scene. 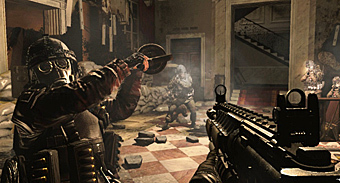 As the Modern Warfares don’t use third-person cutscenes and don’t have playable characters speak while the player inhabits them, all the player has to go on to understand his character is the weapon in his hands. 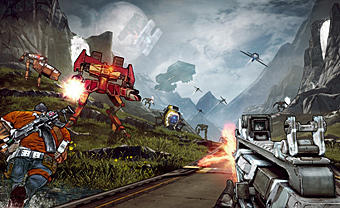 The U.S. and U.K. characters are typically equipped with some kind of super-accurate assault rifle, complete with laser sights and grenade launchers. It paints them as efficient, with a zero tolerance for nonsense. 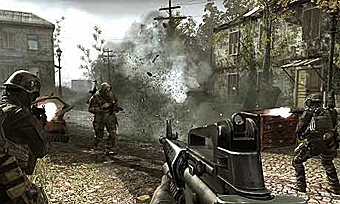 In Modern Warfare 3, however, we spend much of our time with a Russian newcomer. Yuri is a washed-up old veteran hungry for revenge against antagonist Makarov. When we first control him, he raises his weapon and it’s a clunky old AK-47. It still has a scope, but it’s almost useless as the gun bucks all over the place with each shot. This first time I control him, I have to shoot from a second-floor balcony at targets jumping out of helicopters in the distance. It is practically impossible to hit any of them until they make it the ground and get a lot closer. The unwieldy weapons, so different from the tight assault rifles of the U.S. and U.K. operatives, paint Yuri right from the start as something of a (excuse the pun) loose cannon – not quite controllable, not quite known, not quite trustworthy. Then there’s the heavy machine gun given to the player at the start of Modern Warfare 2’s “No Russian” level, tempting you to spray bullets indiscriminately. I doubt it is a coincidence that the very last mission of Modern Warfare 3 equips Price with a nearly identical weapon. It works as a deliberate nod: “This is revenge for that crime and everything that came after it.” But at the same time, it also works as a re-enactment, where Price’s own deluded thirst for revenge has reduced him to the same kind of character who walked slowly through a Russian airport, spraying civilians with bullets. Borderlands 2 and its predecessor, each with their infinite number of randomly generated firearms, do something very similar but also very different. I don’t learn more about my character from the weapons he uses. Instead, I create my own personalized character simply by choosing what kind of weapons I want him to use. More so, these weapons are going to be the weapons that I want to use (within a game, at least). The character is the gun is me. The primary pleasure I get out of Borderlands 2 is the pleasure of shooting a gun. Who I am shooting the gun at and why I am shooting them hardly matter. It is all simply an excuse to feel how a particular gun behaves differently from every other gun. I care so little for my actual character in Borderlands 2 that I almost feel less like I am playing a first-person shooter and more like I am playing a third-person platformer where my character literally is a gun. Every single gun has so much character. On the surface, there are only five different types of weapons in Borderlands 2 (pistol, submachine gun, assault rifle, shotgun and heavy), but within each of these categories there are countless variations that never make themselves known on a screen of stats but rather only in their firing. An assault rifle, for instance, can be anything from a belt-fed heavy machine gun to a single-shot, long-range rifle, to a multi-bullet-devouring grenade launcher. It is not enough to just compare the stats of two different assault rifles. Each will look and feel drastically different. A gun with far worse stats might have a better scope, or maybe the bullets will travel quicker. Maybe it will simply be a lot nicer to stare at on your television screen for the next two hours until you find an even better one. Maybe it will sound better. Allow me to tell you about the perfect assault rifle I found in that pile of skag feces. It has a long, narrow barrel and a relatively slender body – not a chunky, boxy thing like my previous belt-fed gun. It fires automatically, but slowly, with a steady drumbeat of a firing rate. Whereas other machine guns just spray bullets everywhere, this gun feels restrained and paced, each half-second shot another precision bolt. It has no scope, just an old-fashioned iron sight down the bare top of the gun. It feels just right for mid-range combat, the perfect mix of restrained accuracy and stopping power. It is exactly what I wanted. It resonates a quiet confidence – exactly how I want my character to be.